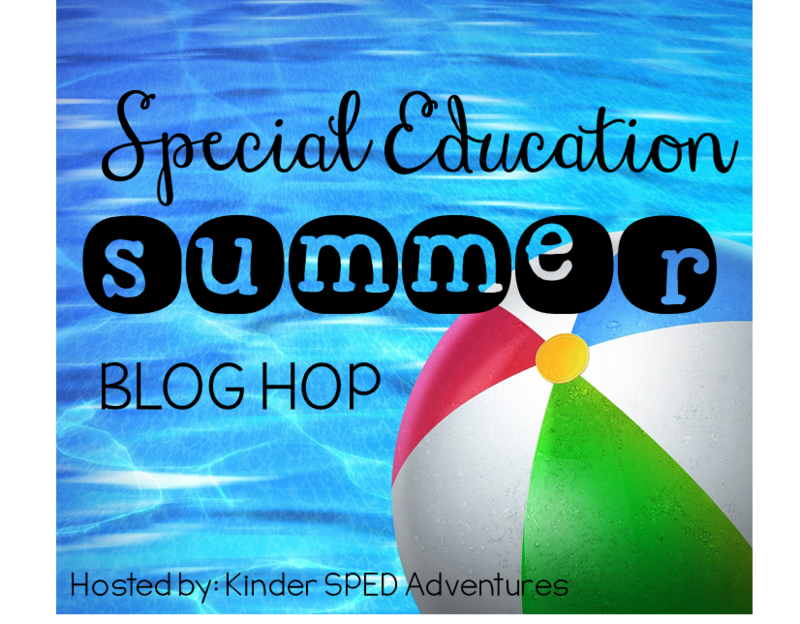 Hi everybody and welcome back to the summer blog hop! Hope your summers are going well! What fun has everybody been having? 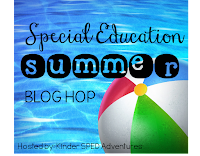 Some of the initial forms I use are those that I shared in Week 1 of our Bloghop such as class scheduling and staffing schedules, so be sure to go back if you missed them. 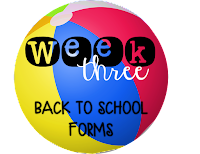 After I have scheduled the day and where I want all the kids and paraprofessional(s) to be (see week one of this hop), its time to turn my attention to other Back To School forms I may need. 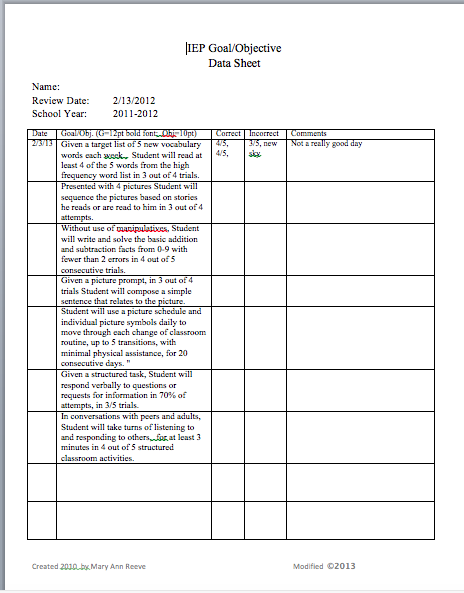 One of the most important forms I need each year is something to track goal/objective progress for the students. This one below if a quick and easy one with date and goals/objectives listed on the left hand side. I type the goals in bold font and the objective in regular font to differentiate between them quickly. 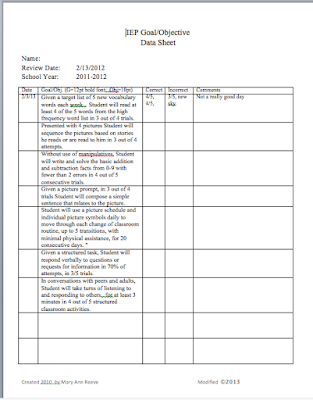 The other side of the form has number correct/incorrect on work they have completed for that goal/objectives and a last column for comments written by the adult that worked with them on the skill. I like to have several copies of these forms for each student and while it may not seem to be the most efficient, I provide copies to my paras as well as myself. This makes multiple copies but I do it because I have each adult meet with every student in some way every day and I want the data sheets to be totally accessible to them at the moment. 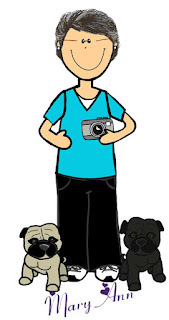 This way everyone can record data as soon as it occurs. I tend to work this way just because of the makeup of my class each year. Some years I can place one set of forms in a central location and everyone can record on one form. One of the most important forms I find during the year is the homeschool communication form. One of the most important forms for back to school I use is a Home/School Communication. 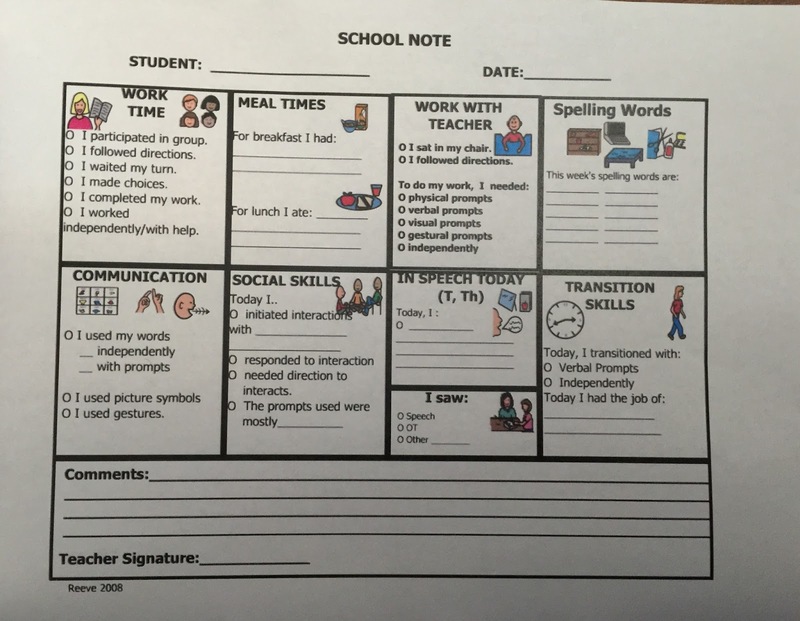 This is a form I develop based on the needs of the students and parents each year to maintain daily communication of what their child is doing in the class. 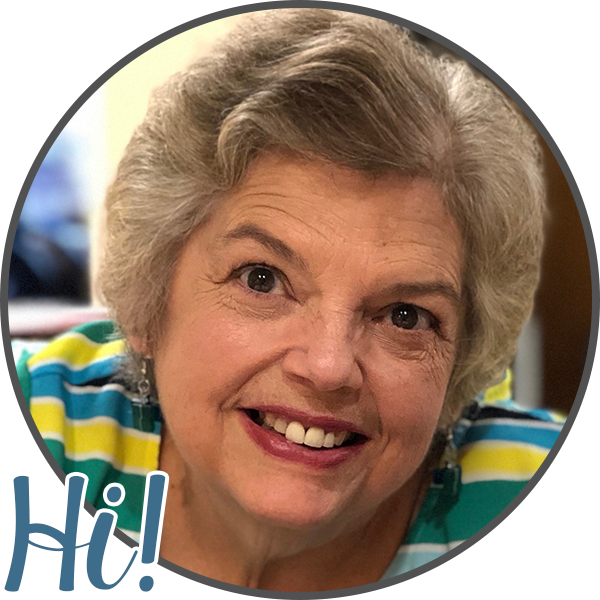 I frequently had at least one student in my class each year that was non-verbal and several others that while they could talk, had a difficult time sharing information with their parents about what went on at school. A form like the one above is an example of one I have used. It includes specifically selected portions of the students school day with checkoff items about that section in the box. For example, in the box for Communication, it might say "I used my Words today", "I used Picture symbols" or "I used Gestures". These are just the items I needed for the student I last used these with. I thought I would share several of the forms I have used with you. Depending on the makeup of my class, I occasionally use the same form for the entire class, but more often I make forms that fit each child and use those. 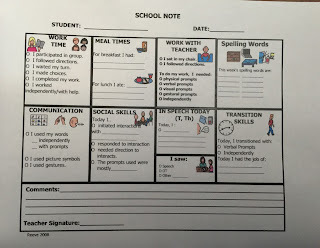 Sometimes the forms for Home/School Communication are based on classroom activities such as this one below. 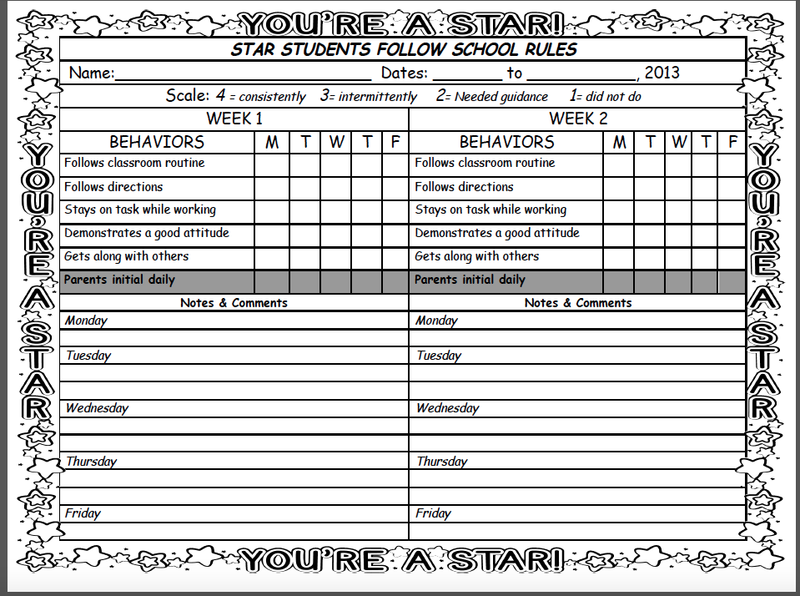 This form is set up for 2 weeks and is based on the theme for the classroom of YOU ARE A STAR! that I used that particular year. It is designed to be a quick number assessment system of reporting behavior to the parents on a daily basis. 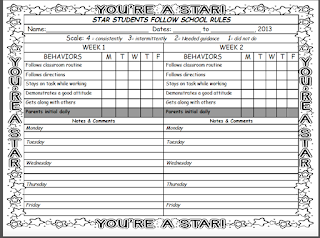 The behaviors on this form corresponded to our class rules and the form left room for both teacher and parent to write short notes if needed. These are the most important types of forms each year for me. 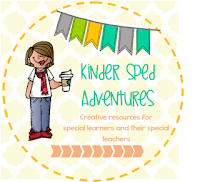 Don't forget to hop through all of our blogs this week for great ideas for BTS forms. I like your communication forms and I plan to use something similar in the fall!